5 Carpenters Cottages01263 715779work01603 870304fax Self-cateringLook no further than 5 Carpenters Cottages for a property full of comfort and cosiness! Charming from the moment you walk through the front door, this traditional brick and flint cottage is perfectly located for those who wish to be within walking distance of a good range of shops and eateries. Offering two bedrooms, designated parking and a courtyard garden this cute-as-a-button cottage provides a brilliant base from which to explore beautiful North Norfolk. Enjoy the delightful ambience of Georgian Holt, with its boutique shopping and varying range of good restaurants and pubs. Not far away and within easy reach is the stunning and diverse coastline, offering sandy beaches, wet marshland and traditional seaside towns; Wells-next-the-Sea and Cromer are brilliant for beach days out. The area has some beautiful open countryside for walking, birdwatching and cycling with Holt Country Park on the doorstep and the National Trust's Sheringham Park a short drive away. Explore the hidden and historic treasures of the National Trust properties that stand proud at both Felbrigg Hall and Blickling Hall. Also, rich in history is the cathedral city of Norwich. Spend a day meandering around the shops, visit the Castle Museum to learn about life in Norfolk and don't forget to visit the breathtaking Cathedral with its impressive spire. • Notes: The cottage is not suitable for children under the age of 5 due to the open tread staircase to the first floor. 24hr Laundry Service available on request. 5 Carpenters Cottages offers weekly bookings starting on Saturday. 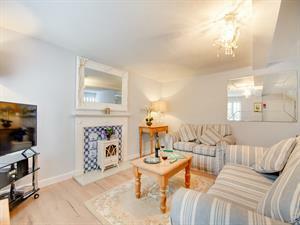 Look no further than 5 Carpenters Cottages for a property full of comfort and cosiness! Charming from the moment you walk through the front door, this traditional brick and flint cottage is perfectly located for those who wish to be within walking distance of a good range of shops and eateries. Offering two bedrooms, designated parking and a courtyard garden this cute-as-a-button cottage provides a brilliant base from which to explore beautiful North Norfolk.